Banana plants, which encompass over 50 species in the Musa genus, grow as large as trees in their native landscape. They actually are in the herb family, however, and they never develop woody trunks like trees. 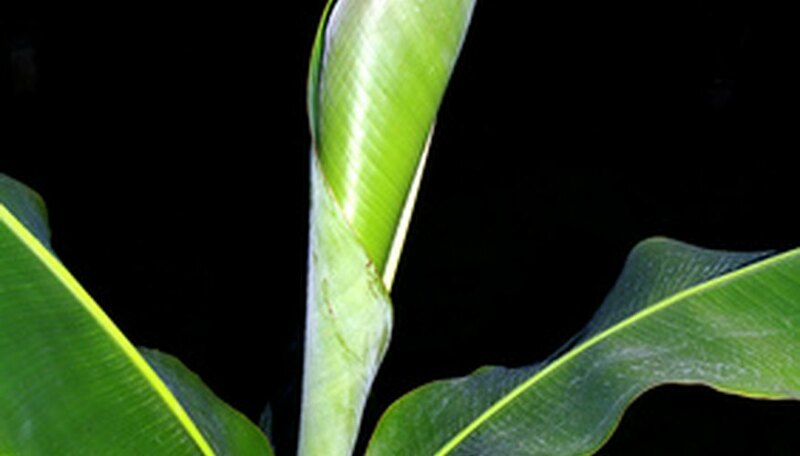 The trunks, also known as pseudostems, are the bases of the huge leaf stalks. Transplanting banana plants is not an extensive project since they never develop a woody root system. They are also fast growers and recover fast from transplanting. Dig a trench around the pseudostem of the banana plant. The trench should be 6 inches from the edge of the stem and encircle it completely. Dig down 12 inches. Angle the shovel and dig underneath the pseudostem. Don't worry about cutting the roots.They will be rapidly replaced once transplanted. Grasp the pseudostem and lift the banana plant out of the ground. If any roots are still attached to the ground, cut them off at the bottom of the root ball. Dig a hole at the banana plant's new location. The hole should be twice as wide and just as deep as the root ball. Place the banana plant in the center of the planting hole and shovel the dirt back in around it. Tamp it down with your foot to remove any air pockets and add more until your banana plant is buried as deep as it was previously. Water the banana plant until the soil is thoroughly soaked. This will remove any residual air pockets and provide the roots with the needed moisture to begin growing again. Keep the soil moist at all times for at least a month to allow adequate root establishment. Transplanting your banana plant is most successful in the late spring or summer when it is most active in growth. In cooler regions, the plants will go dormant in winter and transplanting at that time may cause the plant to perish.